It is late. I have to be up early. 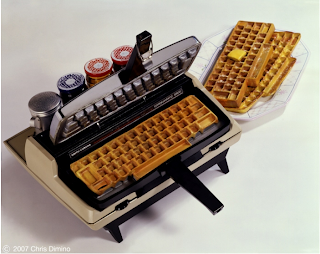 Since we have virtual type-ins, how about you guys join me for some virtual breakfast tomorrow morning? My only problem with this is that in the project description, they describe a typewriter as "useless object." Neat waffle iron. I'll be thinking of breakfast while I am at work. After work I visited the link you posted. They do have one thing incorrect, the typewriter is not a worthless item.